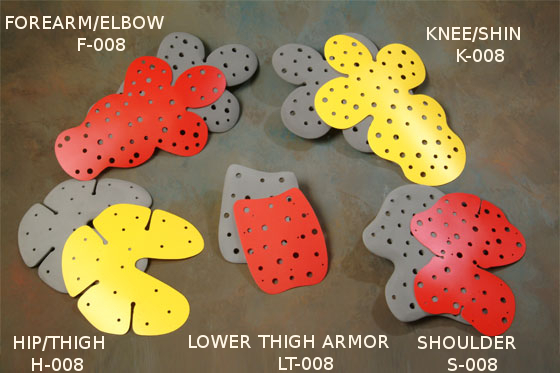 Unlike todays protruding "hard plastic" armor, Impact's "low profile" flexible limb armor gives improved protection coverage, while providing a cleaner and more compact profile for your garment. Featuring Impact's UNIQUE "dual staged" impact energy dissipating system, Impact's "low profile" limb armor provides maximum protection perfomance when you need it! Our armor is designed to replace the current armor in your suit or provide addtional protection by covering areas left unprotected in unarmored suits. Dual staged impact core & impact diffuser: Gives superior impact energy dissipating performance. Taking a page from it's successful line of torso protection, Impact's patented limb protection design incorporates the features and proven performance of their larger siblings. Suggest retail: $57.00 per pair. WHAT A BARGAIN!